The title of this post means exactly what it means: it is Chavez that is breaking up with Israel, not Venezuela. The people of Venezuela are much smarter than that. Or ignorant as the case might be. But Venezuelans of good faith, of good name, of good will, do not break relations either with Israel, or Lebanon, or Iran, or Palestine, or Egypt. See, Venezuelan people of good will know that the Middle East is a very complicated situation, and we know that we have no business involving ourselves in there, except for trying to help in any way we can, without taking sides, in reaching peace one way or the other. Just as Israel has no business meddling in border problems between Venezuela and Colombia over FARC crossing over as they please. See, Venezuela is a gorgeous mosaic of people. We have plenty immigrants form diverse areas of the Middle East. But we also gave refuge to many Jews fleeing the horrors of Nazism, or the horrors of Europe diverse forms of intolerance. We know that we all get along, blacks and whites, natives and mestizos, Jews and Muslims, Catholics and Evangelical, commies and democrats. That is, until Chavez was elected president in 1998 and started forcing upon us divisions that were alien to our gentle tropical culture. Since his election race has become an issue. Useless social warfare has become an issue. Civil rights have become an issue. And none for the good. Now anti semitism is becoming an issue. This blog has reported whenever it could about the creeping anti semitism in Venezuela these days. But do not take only my word: read yesterday's column from Milagros Socorro in El Nacional where she picks up the same disgusting add that appeared in El Nacional last week. Her words on how our beautiful country is torn apart by the vices of a few are only too eloquent. Now Chavez in his megalomania has turned his gaze to the Middle East where he wants to become a player. I can assure you, dear Israeli leader, or even dear any Middle East reader, that it is a decision of Chavez alone with his camarilla. We, as a people, have never been consulted on what should be Venezuela's policy in the Middle East. And I can assure you that we will never be consulted on that topic by Chavez. In fact, he has long stopped consulting with anyone on anything except perhaps the soon to be corpse of Castro. I can also assure you one thing: Chavez does not know much about the Middle East and its very complicated history. Nor does he care much about you. See, the only thing he wants is to screw the US in any which way he can, even if it means a close association with the Iran regime of fanatic and intolerant Ayatollahs who have no problem in subjecting women to all sorts of second class citizenship, hanging gay teenagers, persecuting Baahist faith, financing any pro Shia terrorist organization and what ever else uncivilized that one can come up with. In fact, it is difficult to imagine a country as opposed to Venezuelan values of freedom and carefree lifestyle as Iran is. That is why it is so objectionable of Chavez not to even notice that the only thing that Ahmedinejad has not yet said is "a good Jew is a dead Jew". Never in our history we have had a president that openly supported a country whose aim is the elimination of another country. 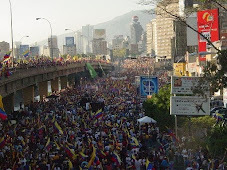 If you can read Spanish I will recommend an article on how the news was reported in Venezuela. First, he used the commemoration of some local independence event of 1806 to announce the withdrawal of our ambassador to Israel. Funny, because already Venezuela had only a "chagé d'affaires". But Chavez always needs to be bombastic and the chargé became ambassador for a few seconds before he was removed anyway. Then on the same protocol act he decided to change one of our national holydays by moving it from March 12 to August 3. Just like that, because he has decided to rewrite Venezuelan history in a way that satisfies him better, regardless of what really happened in a given date. See, he is like that, changing names, dates, places, at will, like any fascist of commie dictator. All of course duly surrounded by many generals in full drag. It is important for you to understand that Chavez has long stopped being considered as someone sane. Nobody so obsessed about his glory, his safety, nobody so blindeded by his US hatred can long remain sane. Venezuela is now a military controled regime with someone cetifiable at the helm. You of all people know about these type of guys. So please, do not harbor ill will against the Venezuelan people, keep in mind that any ill advised move of Venezuela in the Middle East comes from Chavez feverish brain alone. We are trying our best to control him but he has too much money and too many amoral cowards getting rich around him, at home as well as abroad. But this shall pass and we will become friends again as we have been friends with all countries in the world. That is what we really are, a friendly people, not the hateful crowd that Chavez would like you to beleive he represents. The news is spreading fast. Fausta has a complete summary of Chavez recent eccentricities, break up included. Plus a great photo montage of Chavez and any dictator around, courtesy of Miguel.